Pet Cameras For Lonely Pets And Worried Owners - Share Your Story - Alfred Center | get the most out of the best home security app! Alfred Camera comes in handy when we want to keep track of our pets when we are away. We can see exactly what our furry kids are doing by simply turning old unused smartphones into interactive pet cameras! Do you have a four-legged furry baby to take care of? A pet might only be a part of our life, but for it, we are everything in its life. When we are away, not only do we miss our pets, but they also do. 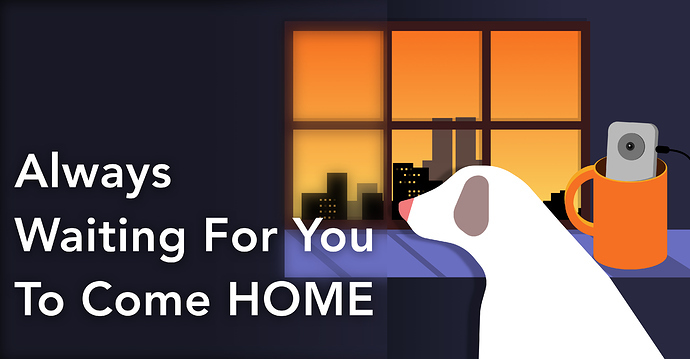 Some furry kids might be trouble makes, while others might just be sad and lonely while waiting for us to come home. Alfred Camera is a FREE app that lends us an eye to see what our furry kids are doing when we are at work, on vacation or a business trip, and helps us chat with them through the two-way audio, making them feel as if we never left them. By investing nothing more than just 10 minutes or so to set up the pet cameras, both of us and our pets can have peace of mind. Alfred provides many handy features to let us keep in touch with our furry kids. Motion detection keeps us always informed of what’s going on in the room while capturing any movement. Night vision is supported, which gives us a clear vision of them even in dim light. We can chat with them through the microphone on the device and tell them to behave themselves when they are trying to sneak food out of the kitchen. Also, we can definitely take pictures or film them to record the funny moments. Wondering what our pets would do while we are away? Are they bathing in the sunshine in the backyard during the whole afternoon? Are they trying to do something sneaky while they are not under our supervision? One of our users told us she once fixed a tiny iOS device on her 5-year-old Labrador just for exploring his life while she’s away. She found out he would always start to be looking out the window and waiting for her one hour before she comes home. Lovely stories like this will always confirm our belief that we are doing something valuable. Russell, one of our user, told us that he used Alfred to keep an eye on his cats, but after his apartment had been broken into, he decided to point more cameras at his front door and back window to prevent his cats from being hurt by intruders. Now he has six cameras monitoring his apartment in total and he suggests everyone who has a pet buying very basic $10 android phones and starting to protect them. Alfred comes in handy while I’m at work because it allows me to keep track of my cats. I also have cameras pointed at my front door and back window. I started doing this after my apartment had been broken into. With the night vision mode and motion detector, I am given a way to know if my apartment is being broken into again. So I can call the police and then they can check it out. I have used other software like Alfred, but they are a lot more expensive and do not offer the reliability and features of that Alfred offers. This is why I use the pay-version, so I can unlock all of the features. Também usei para vigiar minha gata quando viajei . Estou passando um mês no rio de janeiro , estou vigiando meu cachorro e minha ha 3 mil quilômetros. E conversando com meu cachorro fred. I use it for my pretty cat. Ok. I am in canada. Do you ship here?? Alfred is a free app on Google Play and App Store. You can download it from Canada! Lol right that’s what I thought too. I have used Alfred for a few years it’s easy to use and never lets me down… And that’s saying something for being free … I love it! !